Last week, the price of gold rose to its highest level in five months. After plunging in the aftermath of last November's election, prices were at their best since last June, finishing at $1,286 an ounce. Why is the precious metal soaring again? There are a couple of reasons. Gold is usually a safe haven when there is fear of turmoil. President Trump's sudden and unexpected rocket attack on a Syrian airfield and building tension with North Korea have created new geopolitical uncertainty. Also last week, Trump gave an interview in which he said he thought the dollar is too strong. A strong dollar makes U.S. exports more expensive. Trump's comments caused the dollar's value to sink on world currency exchanges, and since gold is priced in dollars, that caused the relative price of gold to rise. Gold is traditionally impacted by the fear factor. When there is fear of political or economic upheaval, the price normally goes up. Financial advisors often suggest everyone's portfolio should contain a little gold as a hedge against uncertainty, but that doesn't mean you need to rush out and buy it at these prices. Mitsubishi analyst Jonathan Butler told Canada's The Globe and Mail that the precious metal has moved into “overbought territory” after its recent run-up. Still, there are plenty of analysts who think the long-term outlook for the precious metal is bullish. In an interview with CNBC, U.S. Global Investors CEO Frank Holmes attributed much of gold's recent moves to real interest rates. “What we saw last year is real interest rates in the U.S. went positive and gold sold off, then (this year) they went negative again, and gold has had a rally,” he told the business news network. Holmes recommends that 10% of investors' portfolios be weighted in gold. The question is, how to buy it. There are several ways, and your politics and level of fear might influence your choice. Conservatives, for example, tend to like physical gold – gold they can stash away in case the economy collapses. During the Obama years, cable TV was cluttered with commercials for physical gold bars and coins. While you might feel secure having gold in your possession, you have to have a secure way to store it. Also, you should exercise caution when buying gold coins to make sure you understand how much gold they actually contain and how much the dealer is marking them up. 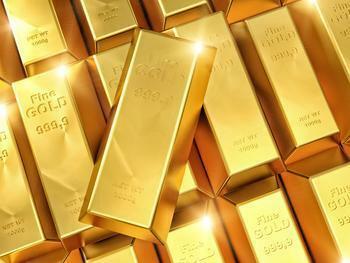 An easier way to own gold is by owning gold stocks, which you can buy and sell through your online brokerage account. SPDR Gold Shares (GLD), for example, is an exchange traded fund (ETF) that tries to reflect the moving price of physical gold bullion. It actually holds the physical gold so you don't have to. You buy shares, just like you would stocks, making it easier to liquidate your holdings than if you were holding physical gold yourself. Another way to get gold exposure is to own gold mining stocks. These ETFs invest in shares of various gold mining companies. The stock price tends to rise and fall with the price of gold, but there is the added advantage of owning a piece of actual companies that tend to be well-run and may return a portion of their profits in the form of dividends. An experienced and knowledgeable dealer can help you find the best prices for gold, silver, and other precious metals. The ConsumerAffairs Buyers Guide to Gold can help. It contains reviews from both experts and consumers and compares many of the larger dealers. You should also be sure to consult with your financial advisor about any investment.